This post should receive a penalty for delay of game. 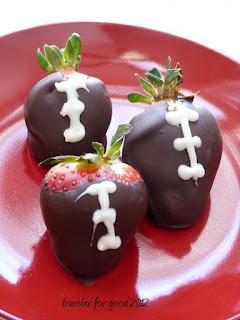 Inspired by a picture I saw somewhere last week, I made these chocolate dipped strawberries for last Sunday's game. I really don't care about the Super Bowl, but I do like eating pizza with friends. Our approach to the big game? Playing games and watching the commercials. Our host introduced a game called Wise and Otherwise. The goal? To create plausible endings to proverbs and sayings from around the world. An old Cameroonian saying, "If you throw a squirrel in water...." You make up an answer and everyone votes on what they think the really saying is. These strawberries are easy to make. This time of year the strawberries aren't especially pretty, so it's better for everyone involved to coat them in chocolate. Melt -chocolate chips with oil in a microwave safe bowl, stir until smooth. Dip strawberries in chocolate to coat, allow extra chocolate to drip off into the bowl. Set finished strawberry onto wax paper to cool. To put the laces (or any other design), I melted 6 or so white Wilton candy melts in the microwave and then put the melted candy into a small ziploc bag. Cutting a tiny hole in the corner I used it as a makeshift (and disposable) decorating bag to draw the laces. Let your friends oooh and aaah. Then eat.